In 2009, ELIET launches a renewed version of their Edge Dresser, the ELIET Edge Styler. ELIET is the inventor of the edge dresser en has won the Bronze Spike Innovation Award at the International Agricultural show Agribex in 1996. The new design has to improve the user comfort and the design also aims to achieve a maximum manoeuvrability. The machine has a wheel drive that pushes the moving knife forward. When the knife moves forward, the wheel traction helps increase the stabbing power. However, the resistance of the soil which the knife must penetrate will counter the stabbing, when the knife moves backward the wheel traction counteracts this, which creates a damping effect. In this way ELIET manages to counteract the vibration through the way the machine was built. In the machine's Pro model, an additional vibration damping system is integrated into the steering wheel. This also filters out the high-frequency vibrations. A football player has studs on his shoes to provide a better grip on the field. The wheels of the ELIET Edge Styler were also equipped with rubber studs to have a better grip on the lawn, especially when it is wet. This offers the extra advantage that your terrace will not be damaged when you drive over it. Because the speed with which one cuts a border, a trench or a cable slot depends on the kind of soil and the obstacles in the shallow subsoil, it is important to carefully balance the driving speed. That is why ELIET developed a compact two-step reduction gearbox which reduces the incoming rpms from 2800 r/min by no less than 54 times. Combined with a variomatic, the driving speed can then be continuously increased up to 30% with a single operating handle on the steering wheel. The large wheels are covered with a layer of rubber. The profile on the wheels is inspired by the studs on football shoes. 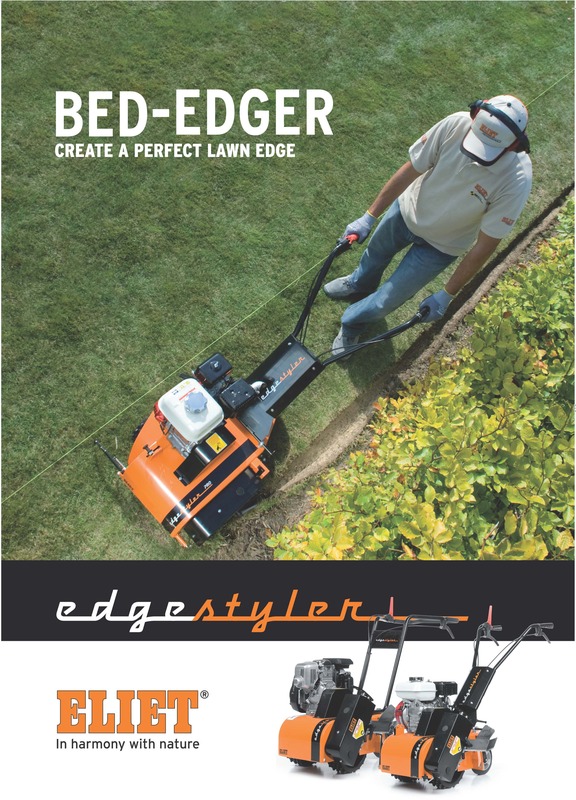 Just like a football player, the Edge Styler also wants to have an optimal grip on the lawn to drive the stabbing knife. Especially in spring, when the lawns are somewhat wet, this profile is definitely an advantage. It avoids wheel slippage which prevents damage to the grass. This innovative machine was mainly designed to mechanize making lawn edges. The technique used is that of a stabbing knife. In this case, the knife makes horizontal stabbing motions where a small sod at the edge of the lawn is cut away and this creates a smooth edge that gets the shape of the knife. U-shaped knife : cutting shallow trenches in a lawn to install irrigation systems or DC low-tension cables. Angle knife: for removing sods between hard paving and a lawn in order to recreate a space which prevents the paving from being overgrown. Cable driving knife: to outline the work space for robot mowers a wire must be installed. Using a special knife and unwinding system, the Edge Styler can be used to bury a DC cable in the lawn without damaging it. Golf bunker knife: allows for very high edges to be maintained, as is the case for bunkers on a golf course. The ELIET Edge Styler has an engine with an integral reduction gearbox. This enables the torque to be increased approximately 6-fold. Consequently, the engine does not have to run at full throttle. 2,800 rpm is more than ample to provide enough power to the blade and the wheel drive. This characteristic improves the petrol consumption, and the operator also benefits from a reduced noise level. If a lawn edge has collapsed or is partially destroyed, it is usually better to cut a new edge.In this case, it is recommended to mark out a new edge using a piece of string as a reference. You then use the handy guide at the front of the edge dresser to follow the path of the string. These days landscaping allows for unlimited creativity. Lawns with straight corners were replaced by free-form lawns. The Edge Styler was designed to, in addition to the classic straight borders, also install those round shapes without any problem. * The machine is designed to ride on two wheels. Two wheels provide perfect sideways stability but still allow for extreme manoeuvrability. The machine does in fact have three wheels, but the third wheel is a swivel wheel and doesn't impede the machine's manoeuvrability, but it was added to the design at a later stage to increase the operator's comfort. * The knife moves at the level of the axle line of the two carrying wheels which insures that it seamlessly follows the wheels' tracks. This makes it easier for the operator to form the desired round shapes. The Eliet Edge Styler features an "ratcheting step pedal" on the lower right of the machine, allowing the operator to use the strong leg muscles to position the blade to the desired work position prior to inserting it into the soil. The release handle for the blade mechanism is on the left-side handle grip. Elevate the rear of the machine off the soil and squeeze the handle to release the blade control mechanisim. Step on the pedal repeatedly until the blade has racheted to the desired work position. Then lower the rear-end of the machine and guide the blade into the soil. It is important that you rachet the blade to the correct work position before inserting it into the ground, so as not to unduly stress the blade racheting mechanism. This convenient blade control system is another example of Eliet's devotion to ergonomic excellence! Because the machine makes stabbing movements to create the lawn edges, this logically creates pulsating or jolting movements, which is unpleasant for the operator. ELIET's design is special because it ensures that these vibrations remain very limited. The technology behind this is a balancing act with weight distribution and the machine's mass delay. The machine's centre of gravity is very low because 30% of the total machine's weight is in the wheels. This means that the centre of gravity lies at the level of the knife guide. Because of this low centre of gravity the knife's stabbing pulses must be almost fully converted into linear movements of the machine's mass in order to transfer the vibrations. Because the full machine weighs almost 95 kg, the energy will take the easiest road and instead of moving the machine, the knife will cut through the soil. The knife has a stabbing frequency of 15 Hz. Because of the machine's mass sluggishness it cannot possibly take on this frequency, which has a damping effect. In addition, the machine has a wheel drive that pushes the moving knife forward. When the knife moves forward, the wheel traction helps increase the stabbing power. However, the resistance of the soil which the knife must penetrate will counter the stabbing, when the knife moves backward the wheel traction counteracts this, which creates a damping effect. In this way ELIET manages to counteract the vibration through the way the machine was built. In the machine's Pro model, an additional vibration damping system is integrated into the steering wheel. This also filters out the high-frequency vibrations. The machine is designed to ride on two wheels. Two wheels provide perfect sideways stability but still allow for extreme manoeuvrability. The machine does in fact have three wheels, but the third wheel is a swivel wheel and doesn't impede the machine's manoeuvrability, but it was added to the design at a later stage to increase the operator's comfort. * The knife moves at the level of the axle line of the two carrying wheels which insures that it seamlessly follows the wheels' tracks. This makes it easier for the operator to form the desired round shapes. For cutting straight borders the swivel wheel can be locked in its straight position. This reduces the moveability of the machine, which is not desirable for cutting straight borders. The guidance arrow on the side of the machine serves as a guideline if the operator laid out the border in advance using a tie line. The ELIET Edge Styler tries to offer the operator optimum comfort and ergonomics. As already noted, special care was taken to lower the vibration level for the operator. This avoids tiring the upper body when working long hours. In order to give the operator the ideal bearing during use, the height of the steering wheel can be adjusted continuously. Because the machine was also designed to maintain the edges of bunkers on golf courses, the steering wheel can also be adjusted sideways at an angle so that the operator can work in a comfortable position independent from the waves and slopes of the terrain. When cutting a free lawn edge, the machine tends to drive itself away from the lawn edge because of the pressure on the wing when cutting off the sod. That is why the machine is equipped with an anti-deviation disk. This jagged disk can be lowered which causes the teeth to press into the soil when driving the machine. They act as an ‘anchor’, which prevents the machine from drifting sideways. This allows the operator to cut the lawn edges without interruptions.